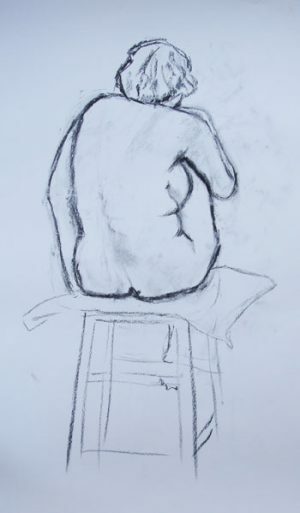 Yesterday I began life drawing classes with my friend Adrian Smith. As you can see (if you follow the link) he is already a most accomplished artist. His reason for going is that “you can always learn more”: my reason might not seem so obvious – I am trying to loosen my method of working. My method for writing the Stone Dance was VERY intensive. Besides, it is hard, when one grips on to something that tightly, to let go. Now that I’m working on something new, there is an ever present danger that I will slip back into my old (a decade long!) way of thinking. I judged that to assault this frontally was just likely to make my ‘habituation’ dig in… I don’t have separate compartments in my head for writing, drawing, or anything else creative – it forms a fluid oneness… Thus, by loosening up my drawing, I believe I am performing an outflanking manoeuvre on myself… that will free up my writing. Good for you. Doing something to develop your talent is the right way to do. I’ll be looking at your blog to see how far you go. Not bad at all! Especially for a first lesson. Am curious to where this’ll bring you. First time you used charcoal? It doesn’t show! I can look at his work for hours!